Recently I completed 4 out of the 8 weeks of the new home workout program I am doing called Hammer and Chisel. My main goals for this program were to increase my strength, and lose a bit of fat in stubborn areas, such as my lower belly, upper arms and upper back. Also, I wanted to clean up my eating a bit more…I’m usually a clean eater but over the winter break my sugar intake went up and my healthy food intake went down. 4 weeks into the program, I’m happy to report that I have made great progress towards all of the above mentioned goals! I started the program at 132.8, and on day 30 I weighed 130. At one point I had gotten down to 127, and when that happened I changed my nutrition plan a bit. It’s been a goal of mine for a long time to actually build muscle instead of just losing weight, so I moved up in my daily calories. This was tough for me mentally…as women we tend to want to lose weight, rather than gain weight. It took me a couple days to get over the mental block, and now I am enjoying the extra food. 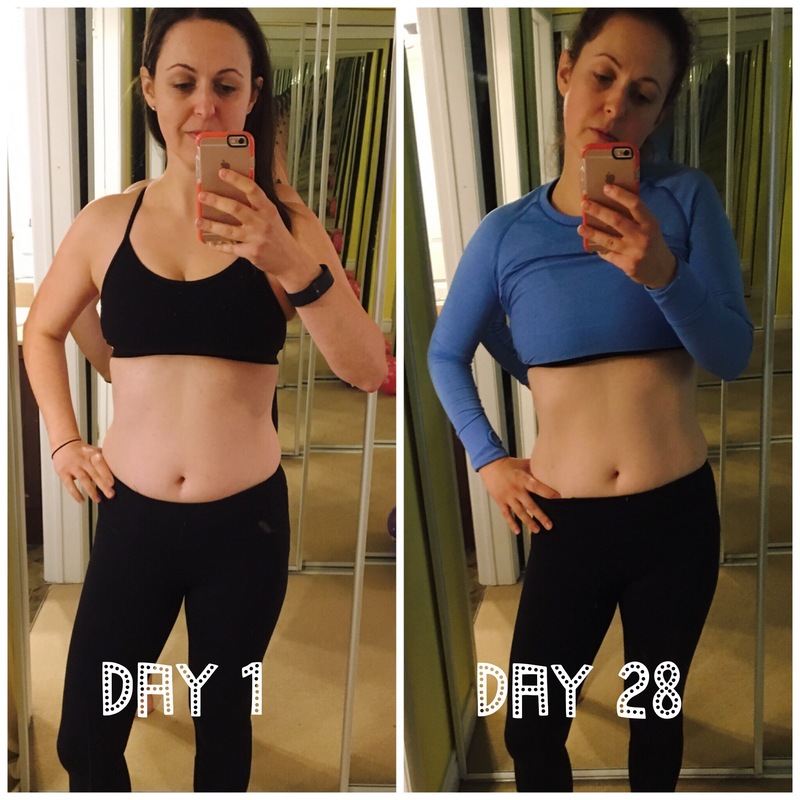 I always tell the women in my challenge groups that the scale is just one tool to measure progress…and that measurements, pictures and how our clothes feel are also really important things to consider. It is interesting to see that I lost inches all over, except for my arms where I gained a bit. I feel like my arms actually look more toned and they definitely are stronger, so that increase was due to an increase in muscle mass, I believe. It can get easy to get caught up in the numbers and the pictures…while I like the challenge of sculpting my body and building muscle mass….these aren’t the true reasons why I love working through a program. My workouts are “me time”. They are my mood boosters. They make me happy and they give me energy, and they help me focus during the rest of the day. They are the one thing I give to myself each and every day. As a mom I’m always giving, giving, and giving and it feels good to give something back to myself! I love the challenge of working through a program and the sense of completion I feel as I move towards the end. It feels good to accomplish something and it makes me feel like I can tackle anything that comes my way! Can’t wait to see what month 2 has in store for me! Categories: 21 Day Fix, Cooking, Exercise, Food, Hammer and Chisel, Meal plan | Tags: Exercise, Food, Hammer and Chisel, healthy-living, motherhood | Permalink.